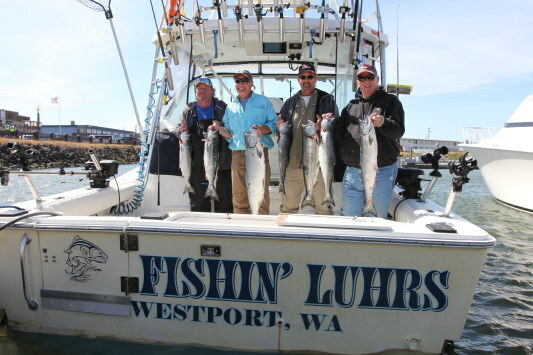 Salmon angling is picking-up dramatically in the Ilwaco area. Chinook fishing is getting better by the day. Coho are also showing up in good numbers. A few early run humpies (pinks) are also being caught. This week started out with an awesome Lingcod trip. These guys caught their fish with Bait and Jigs bounced of the bottom. Sea Bass were caught on live Anchovies and Shrimp Flies. Lingcod and Bass are aggressive feeders so when the bite starts Hang on. The first Tuna hit the docks in Westport this week. So the fun is just getting started. Congratulations Mark and the crew of All Rivers and Saltwater Charters. Next weekend is the Annual Pirate Daze Festival it is the largest festival of the year in Westport. Bring the family and enjoy the town. Have Fun, Be Safe, and we will see you in Westport. 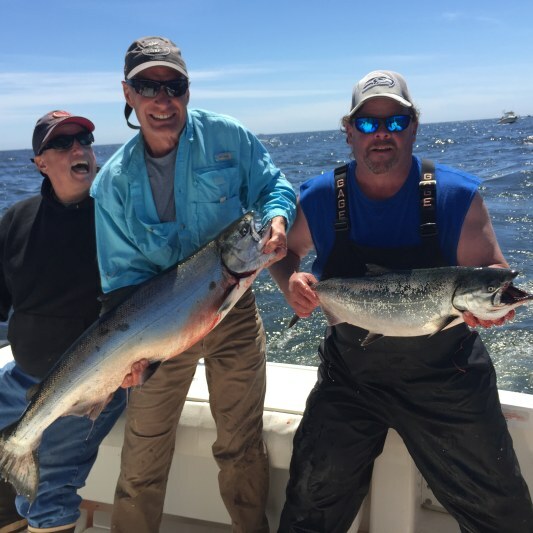 Team All Rivers & Saltwater Charters made the run offshore on Sunday, June 21st, 2015, in search of potentially the first Albacore tuna to hit the U.S. West Coast … and … we found them!!! By day’s end we got hold of 16 tuna with about half on troll gear and half on live bait. We also caught a hatchery steelhead in the same area. Go figure. This marks the third straight year that Team ARSC has brought the first tuna back to a Washington port. As of yesterday the fish were approximately 55nm SW of Westport, WA which is about a 2 hour run in our 30′ Defiance Guadalupe’s. Let the fun begin! Please contact us asap for the most up to date availability for our one day tuna, salmon, or bottomfishing trips out of Westport. Fished 2 days at Neah Bay early this week. 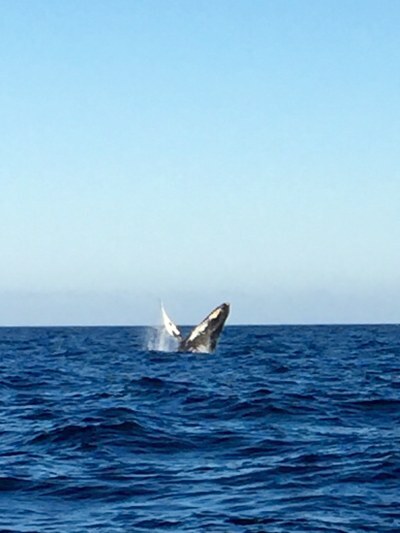 We had perfect weather – no wind for 3 days. We were excited by rumors of great fishing at Skagway, however it was a big disappointment as there was no bait – nothing at Skagway. deep. Fish were running 15-20 lbs. There were a huge number of shakers and quite a few pinks. The pinks were deep. Herring worked shallow at Green Buoy at first and last light. Bigger fish were caught out at Blue Dot by commercials and long-range sport boats. My favorite flasher is a Top Spot 951. Best lure was Purple Hoochie on a 30” leader and second best a Green Spatterback Hoochie. 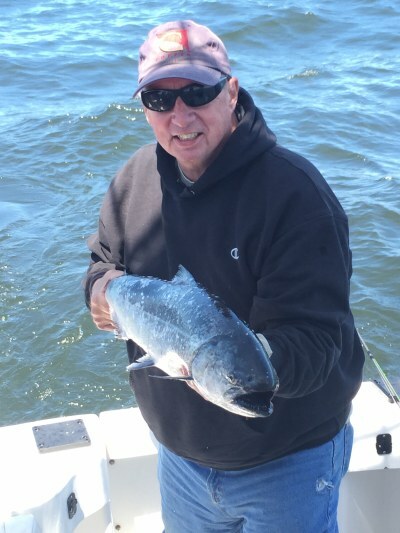 The salmon fishing picked up yesterday 6/22/15 although there was very light fishing pressure there was some jigging action off of the Clay Bank area and out onto the shelf between Pt. Defiance and Pt. Dalco. I would expect to see fish caught at Pt. Evans today as well. The Girl Scout Camp area has been most consistent the last couple of weeks trolling with a few salmon being caught there nearly every day. We have live herring “5 to 6” long. The Taste of Tacoma is this weekend 6/26/15 through 6/28/15 and traffic/parking as always during this event will be a challenge from about 11:00 am on. Sails and Trails Camp for Ages 11-15 years old. The Washington Department of Fish and Wildlife (WDFW) has given an “Excellent” rating for coastal cutthroat in Marine Area 12 during the month of June. The Washington Department of Fish and Wildlife (WDFW) has given a “Good” rating for Coho in Marine Area 13 during the month of June. I just returned from a 3 day trip to Bonaparte Lake in the Okanagan. Granted, it’s about a 6 hour drive to get there, but it’s well worth the effort. 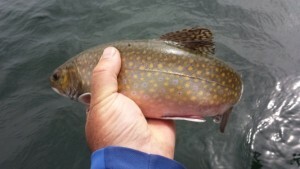 Bonaparte was put on the map last month when a fisherman landed the Washington State Record Tiger Trout (hybrid Brook Trout & Brown Trout) which tipped the scales at 18.5 lbs! I fished the lake hard for three days putting in 12 to 15 hours of kayak fishing each day. I rented a $50/night cabin at Bonaparte Lake Resort which was right on the water. I just tied my kayak to the shore and I could be on and off the water in minutes. Most folks come to lake to persue the bigger kokanee (land locked silvers) which are quite prevalent in this lake. I wasn’t even targeting them and picked up a few 14 to 16″ fish. Instead, I was after the predator fish that this lake holds; Mackinaw Lake Trout, Tiger Trout, and (triploid) Brook Trout. I marked kokanee all over the place from 15 to 40 feet of water. I was trying to fish ledges and drop offs using lead core and various Rapalas. My long hours spent fishing paid off landing two of each species over the three day period (not to mention all the rainbow trout and kokanee caught). Bonaparte also has a healthy population of smallmouth bass that were illegally dumped there. Take as many as you can catch. I targeted them specifically one day catching 40 plus fish. Many small ones up to 3 lbs. 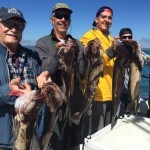 Old grad school buddy, Nick Scotti, and his friends with their evenings catch of Manson Bay Lakers. 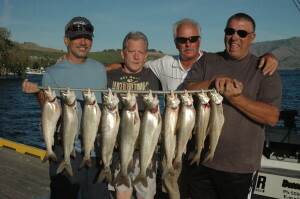 What’s hot is trolling for Lake Trout on Chelan early in the morning at Colyar Ledge. Also hot is trolling the face of Manson Bay in the evenings for Lake Chelan Lakers. When the wind lets you fish the early morning bite at Colyar Ledge, it is very good. We were able to boat a quad on Lakers one morning. 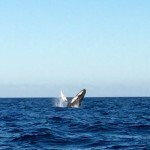 The best depths seem to be between 220 and 270 feet. Evenings are best in Manson Bay in depths of 140 to 270 feet deep. As always, fish within 3 to 5 feet of the bottom and keep your speed around 1.2 mph. The Mack’s Lure Bead and Blade combo our guide, Jeff Witkowski has developed has been very productive. He uses a bead combo to give the rig about a 4” long profile. Bait this rig with a chunk of Northern Pikeminnow. T4 Purple Glow Flatfish and Silver Horde Kingfisher Lite spoons have also been productive. Omak should still remain quite good for Lahontan Cutthroat. However, it can get hotter than… well, really hot down in there when we get 100+ in Chelan. Also, Wapato Lake has still been kicking out nice limits of rainbows. Finally, Roses Lake has become an early summer mecca for Channel Catfish. One of 25 pounds was recently caught. 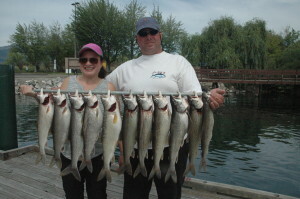 The Sorensons with their mornings catch of Lake Chelan Mackinaw. Your fishing tip of the week is to remember scent. I use Pautzke’s Krill Juice on everything as a cover scent. 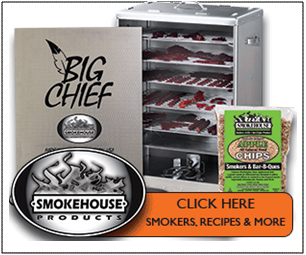 You don’t want those fish to shy away as they charge your lure. The kid’s tip of the week is to keep the fishing foray’s short this time of the year. A couple of hours is plenty. With the first big hot spell of the summer rolling in you don’t want to make it a survival test out there. Work the hours of low light and cooler temperatures. Mid-days this time of the year are good for swimming and staying cool inside. Your safety tip of the week is to keep a sharp look out for floating debris. The lake has filled those last few inches floating some really big logs. You don’t want to hit them! Patrick with a nice Cutt! 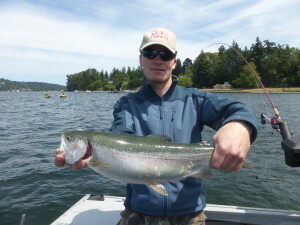 The annual Lake Washington Puget Sound Anglers (PSA) trout derby was held a week ago Saturday. A lot of big fish were caught and I was feeling pretty “bummed” because I did not get to fish it. I worked the “ground crew” which consists of PSA members who get the weigh-in station/awards ceremony venue set-up and then taken down after the event. So my son Patrick asked me to go out with him and catch some trout on Father’s Day. The weather was predicted to be beautiful. It was also the longest day of the year so we did not do a “Zero Dark Thirty” launch. Instead chose a very comfortable launch time of 7:00 am. We were the only boat at the ramp, so there were no hassles. We motored up north of the SR-520 bridge and started fishing. There was a little bit of wind and that put some chop on the water. That turned to be good news because it kept the cutthroat trout active and on the bite. We tried a few combinations until we were able to come up with two consistent producers. The first was orange label herring in a Pro-Troll chartreuse Size #1 Roto Chip Bait Holder. We fished this behind an 8-inch ProChip flasher with the Agitator Fin in the Ultraviolet Plaid with Green Stripe color pattern. The “Fin” is extremely important because it allows you to troll at speeds as low as while 1 MPH and still getting a full rotation. As our trolling speed was between 1.0 and 1.3 MPH, the “Fin” made all the difference! This is because flashers without the “Fin” need to be trolled at speeds great than 1.8 MPH to get a fill rotation. The other successful combo we used was a Brad’s Super Bait Mini Cut Plug fished behind a Holographic Pink 8-inch ProChip flasher with the Agitator Fin. We filled the Mini Cut Plug with minced herring and also added some herring scent to the foam pad. The fish we caught were initially high in the water column but as sun came up, the fish went deeper. As the day went on, we dropped our gear and we got into bigger fish. Also, the ones we caught on the surface tended to be smaller. We released all of the smaller fish except one that was badly hooked. Also, as the day progressed, both the wind and boat traffic picked up. We could not troll slowly enough going with the wind to get any bites. So we would just troll into the wind and keep just enough speed to maintain steerage. This is when the “Fin” really paid big dividends! At times, we were barely moving and many of strikes occurred at this slow speed. Also, at slow speeds, you need razor sharp hooks to get a good hook set. Unfortunately, even with very sharp hooks, we were not able to hook all the fish. But we still got enough to get our limit while releasing most of the smaller fish. Stomach contents include a big sculpin. We finished up mid-afternoon and ran back to the launch. I expected it to be very busy but there was just one other boat there. Just as we were getting our boat on the trailer, several other boats arrived, so I guess our timing was great again! 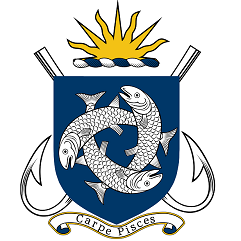 There is a saying that many successful fisherpersons follow and it is to “Match the Hatch”. 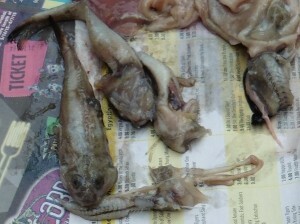 These large “Cutts” tend to be meat eaters and a review of stomach contents of our fish showed they were either eating stickleback or sculpin. Several of the fish only had one species of bait in its stomach, while others had a mixed bag. Perhaps the trout that only ate sculpin, were feeding closer to the bottom? There are many mysteries in fishing. When Father’s Day ended, I had one species of fish that I got but have never seen before. I think it is called a “Drone Fish” but I’m not really sure. Patrick gave it to me for Father’s Day and I have been playing with it ever since! The water level at Potholes is dropping rapidly so the fishing right now has slowed down. Where you found the fish last week chances are they have moved. The one walleye trip I took I fished the general where I have been doing well and drew a skunk. We did have 2 perch trips and caught some fatties. One thing to mention is that there is good fishing for quality trout on the lake measuring in pounds – not inches. I’m using downriggers down about 30 feet with the gear set back 80 feet and using Needle fish. There is not one color better then the rest but you might have one called the Bakini with you. Try fishing off the dam face but be aware of the rocks now starting to show about the mid of the dam. Also, try fishing off Medicare beach. It will be very hot this weekend so get on the water as early as you can. I just had some sores froze off my ears brought on by sun exposure. I did purchase a head gator or a buff that does protect ears and neck and I found that I am much cooler with it on. The wind has not been very friendly the last week making fishing tough in a lot of areas. There have been mixed results for salmon in the last week ranging from the West Vancouver shoreline, Howe Sound, around Bowen Island to the Gulf Islands. The Gulf Islands (Gabriola island) have been spotty at best. The winds have not helped making it hard to fish. The people that have fished Thrasher Rock, and the Grande have produced a few fish but you need to put in the hours. 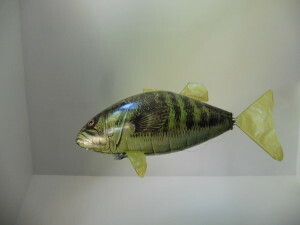 If the wind cooperates for the fishing derby over there this weekend, we should see some nice fish weighing in. The West Vancouver fishery has just started and in the next week or so it should start to get pretty consistent for Coho salmon with some Spring salmon mixed in. A few people have started to fish it. I’ve heard recently of one boat who kept two Coho and another boat I know lost 2 Coho a few days ago. Howe Sound has been the most consistent place in the last week partly because most winds don’t effect these spots and usually you are fishing in flat calm water. Up Howe Sound continues to produce some nice fish Defence Islands is a great bet. A boat I know caught a couple of nice fish. One 24lb and another 17lb. Both were caught on a Rhys Davis head with an anchovy. Hole in the Wall near Horseshoe Bay has been very consistent (partly because it’s been calm) with nice fish ranging from low teens to a wopper that weighed in at 35lbs (and a legit 35!) Other places that have produced fish this week is Salmon Rock and Gower Point just outside of Gibsons. This morning as I cleaned my boat a guy from my marina came in with a nice 16lb Spring from the South end of Bowen island. We have been hitting fish between 60 an 100ft with Gibbs Delta flashers, Chartreuse Glow or the Watermark. There is feed ( herring or anchovies) at Hole in the Wall and as long as that stays, it should continue to produce some nice fish. The July fishery can be great here. Hole in the Wall has always been a favorite spot of mine to try and get the big one especially in the early morning or evening. The main tackle I use on the West Vancouver waterfront is Rhys Davis heads two tone green glow, or UV green with Gibbs Delta, Chartreuse Glow or the Watermark flashers. The 1.5in Gibbs Gypsy, Flaming Hans or the Coho Killer Red Racer spoons are other go to’s. It looks like the wind might blow a few more days and hopefully we settle into a calm pattern. With July fast approaching fishing should start to pick up pretty quick. If you have any charter questions give me a call and I can help you out or if you are trying to catch the big one yourself feel free to call and ask questions or drop by my boat when I’m there and I can show you what I use and point you in the right direction. 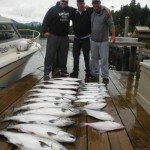 Report submitted by Mark Finney at Watermark Salmon Fishing Charters (604-816-8944). Salmon fishing for Chinook has really turned on over the past week. Close to Bamfield, the “Wall’ has been a steady producer. Kirby Point, Edward King, and Mearse Bluff have all been good. Nearer the surf line, Cree Island, Austin Island and Sail Rock have all had there times. Out on the banks things have really picked up. 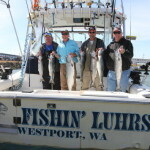 Lots of Chinook in the teens, smaller Coho, 5-6 pounds and plenty of chicken halibut make for an action packed day. The first “Tyee” of the year at 31 pounds came from Kirby Point this weekend. Dan Turner got this 25 pounder near Edward King Island. 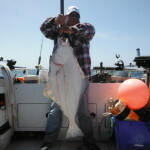 Greg with a 30 pounder taken inshore near Bamfield this week. Ted, Murray and Dave with a catch from the Rat’s Nose area of the Big Bank. 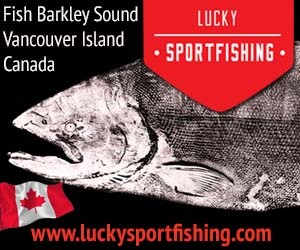 Sockeye fishing in the Alberni Cannel has been fantastic with easy limits most days. Try a mini pink hootchie 20 inches behind a Gibbs High Liner Purple Crush Flasher, 45- 60 ft deep. Halibut fishing has been good but should get even better as these large tides slow down, Lots of chickens on the banks and some nice larger fish near shore. 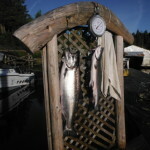 Salmon fishing was GOOD in East Sooke. Most of the fish were caught between Trap Shack and Possession. Most springs were running from 15 to 25 lbs in size, with a couple larger fish into the 30’s earlier in the week. 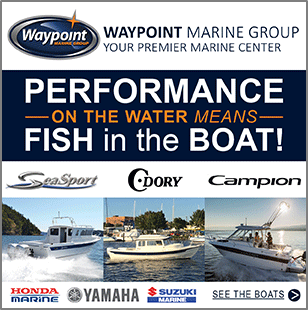 Most fish have been getting caught between 55- 80 ft on the downrigger. Anchovies were the most productive bait and Bloody Nose and Green Glow were the most popular teaser heads. Spoons and plastic baits have also been catching a few fish. Spoons, in 3 or 4 inch size such as G-Force in the Outfitter or Trap Shack were effective. Squirts are working too with Pistachio, Purple Haze and white the best patterns. For flashers, the Lemon Lime and the Purple Onion have been good lately. Salmon fishing was SLOW during this past week. 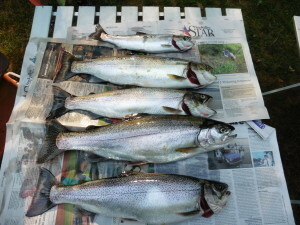 The fish caught were in the 12- 16 lb range with a few in the mid 20’s. A good mix of feeders and mature springs were reported this past week. The fish were hitting 3”-4” spoons as most of the needlefish in the area were small. Anglers did best using the G-force spoons in 3 -3.5in. No Bananas and Outfitter colours have been the most popular. Anglers that were jigging in the afternoon in the gap, reported catching fish up into the 20’s in the evening. Also, Coho Killers in Gold Nugget and Green Splatterback have been pretty productive. The best flasher has been the Gibbs Lemon Lime and the Bon Chovy. 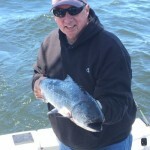 Chinook salmon fishing was GOOD this week. Whirl Bay and Church Rock produced catches steadily throughout the week but Pedder Bay’s been seeing some steady action throughout the week, with reports of anglers getting some nice fishing jigging off the kelp beds. Mac Fish and Gibbs Minnows were the top choices used. There were fish caught into the mid 20’s from Pedder around to Whirl Bay. Most of the fish seem to be ranging from 12-18 lbs. Anchovy was the most productive bait for springs with Green, Special Red, Purple Haze and Bloody Nose being top choices in teaser heads. G-force spoons with both glow and green have been working as well. Also, The Skinny G looks like it will be very popular this year. We have had good feedback from the anglers that have already picked them up. Flashers that remain popular include the Madi and the Purple Onion. Salmon fishing was SLOW near Sidney. A few fish were brought in over the past week into the low teens, but overall not a lot of success. This could be due to fast currents this past week. James Island, near the powder wharf and Sidney Spit is where the few fish caught were coming from. Many anglers are fishing using anchovies in Bloody Nose and UV Green teaser heads. Squirts have been out-producing hootchies and the hot patterns for springs now are Purple Haze, J-79 and Electric Chair. Coho Killer spoons have also been working well, especially in double glow and Gold Nugget. The fishing for springs was GOOD this past weekend. Some nice fish in the JDF Fishing Derby were caught this past weekend, with the top 3 fish were all over 30 lbs! 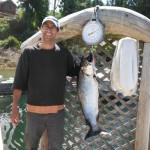 Congrats to Jeff Richmond the winner of the derby with a 34.4 lbs Chinook. The springs were consistent with the best fishing from Possession past Sherringham Point. Anchovies still seem to be the number one choice for Sooke anglers this week. Teaser heads that have been performing well are Bloody Nose, UV Green, Green Glow and the Joanne. Also, the fish seem more consistent in the 60- 80 ft zone. G-Force spoons in Irish Cream and No Bananas have been catching their fair number of fish. The most popular flashers recently have been the Gibbs Madi, the Outfitter and the Jellyfish UV. Fishing for springs was FAIR off Constance Bank and remains SPOTTY along the waterfront. There have been reports of the odd nice fish being around. Fish weighing into the high teens are still being caught at Constance. 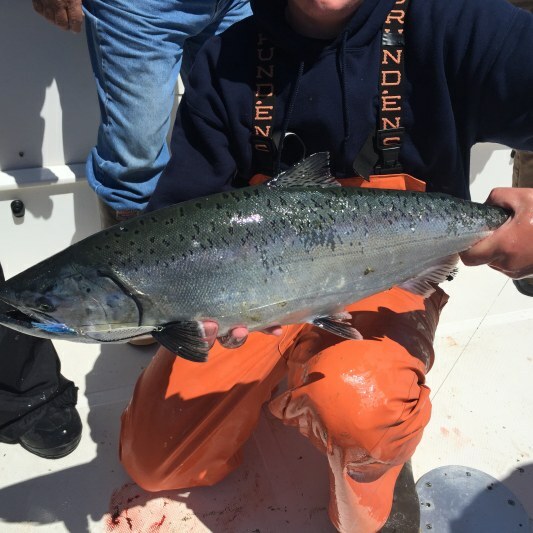 Mike Game weighed in a 29.2 lb chinook from Albert Head caught on an anchovy with a Bloody nose heads. 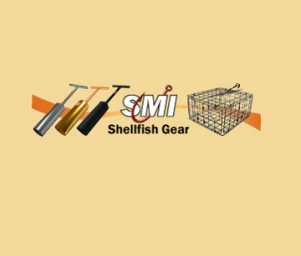 Needlefish spoons and squirts were very effective in getting hook ups. Anglers have not done as well fishing closer to shore but there were a few fish near Brotchie Ledge and clover Point. Anchovies and Tiny Strip have been working well in glow colors. Good choices in plastic baits are the Cloverleaf, Purple Haze and Glo Below squirts. Gibbs Coho Killer, Kingfisher and Coyote spoons in green and glow colours have been very effective. 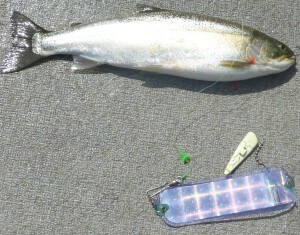 The Lemon Lime flasher with the Glow Green Splatter Back Coho Killer has been a very effective combo out on the bank. The water level is very low. 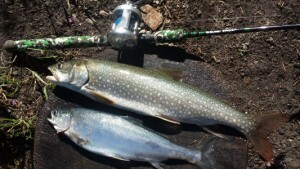 The trout fishing in the mid and upper river is SLOW. The rainbows, cutthroats and resident brown trout are actively feeding on these hatches and migrating salmon fry. During the hatch, match the hatch with dry flies for exciting action. Bead head nymphs are the top producer when a hatch isn’t in progress. Good patterns are Prince Nymphs, Gold Ribbed Hare’s Ears and Wooly Buggers. A fry imitation or a Wooly Bugger will also work, especially for the brown trout.